We all know and love certain things in life. Same as we all know and love certain genres. Some of us love the crime, some of us love the fantasy, the sci-fi, the mystery and all of that. The thing about being a writer is that you get to choose where you write. You get to decide if you're book is going to be all one genre or a mix of one, or two, or even three! It's a great thing and one part of writing is knowing where your strengths lie. Some people naturally write better stories that are set in a certain time or place. Some write better when they have hard facts to back them up. Some even throw all that out of the window, create a whole universe and start from scratch and that's all okay. In fact, it's what makes the reading and writing world so full of so many different things and allows everyone to find something they would enjoy. The trick as a writer is to not get too comfortable. 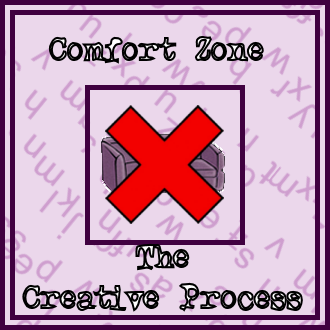 Sometimes, you have to write outside of your comfort zone. It's a big part of the job, and although it can be difficult, scary, in fact even downright terrifying, it has to be done. No matter how much you think you need to write the same stuff over and over, you can't. If you want to grow as a writer, you need to experience different areas of expertise. Sometimes that means you have to do more research - either the internet searching kind, or the going down to the library kind. Or even the interviewing people kind. Whatever you need to do to manage it, you need to find the courage to step away from what you know and learn new things. If you've read any of my books - bar a couple - you'll have noticed that I general stick to the mystery and crime genre. It works for me. I find it easier to write things I know. That includes things like hospital and medical stuff - which you'll have seen in some of my books, if not all of them. That's find for me to do, but like I said, sometimes you have to step out of the comfort zone and expand your horizons. It's a hard balance to strike sometimes. You have to decide how much of a challenge you're going to give yourself. If you normally feel safe writing about romance and sci-fi, maybe you choose to write about an alternative universe and crime. The choices are limitless, you can take what you know and move around into areas of what you don't know. It helps you to grow as a writer, and it stops your stories from becoming predictable and limited. If research isn't your favourite pastime, then you need to keep it at a level where you have some knowledge. That doesn't stop you from going further afield. You may find a new genre that you actually find easier to write, or something that you can write better stories about. The job of a fiction writer is to somewhat create from nothing. To turn letters into books and books into series and so on. If you stay within your comfort zone, you risk clipping your own wings so to speak. Moving away from what you know and into the unknown, allows you to dip your toe in uncharted waters. It helps you grow, it brings new readers to your work and it keeps your muses singing. What more could a writer want? Follow Joey on Facebook or here on her blog to be kept up to date with all the latest news about her books.